6TH ANNUAL UNITY GOSPEL FEST AT KINGSBROOK MEDICAL CENTER | STREETS OF NEW YORK 411 INC.
Brooklyn, NY –Kingsbrook Jewish Medical Center and Mt. Zion Church of God 7th Day will celebrate the 6th Annual Unity Gospel Fest, on Sunday, October 11th from 4:00-7:00pm at Kingsbrook Medical Center, 585 Schenectady Avenue between Winthrop Street and Rutland Road. 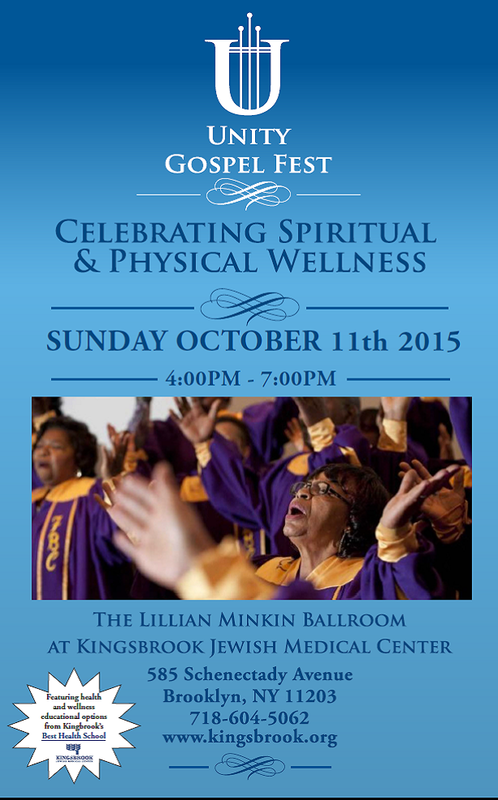 This unique event was designed to celebrate the connection between physical and spiritual wellness, through the unification of gospel music. The event will be held in Kingsbrook’s Lillian Minkin Ballroom, and is free to the Central Brooklyn community. The day will feature the healing sounds of gospel along with health and wellness information for Kingsbrook medical professionals.